Cape Cod is making a few headlines on the population front. All the towns on the Cape, make up Barnstable County. Established in 1685, that makes us the oldest county in New England. Since 2000, Barnstable County is the only county in New England where the population is actually shrinking. There are now more deaths than births on the Cape. With little affordable housing, younger people are leaving for more affordable places to live. That leaves us with an aging population. Since I’m the “Upholstery Blog”, I should try to make sense out of all this, in relation to the upholstery trade, here on the Cape. Younger people have traditionally made up a smaller amount of my customer base. My customer base is made up mostly of middle age to people in their eighties. So even without a younger population, business should be great, right. Well, I’m not so sure about that. I’ve already had customers faced with having their savings depleted because of a spouse in need of medical or nursing home care. Retirement savings have dwindled due to the poor return on investments the last several years. So that’s beginning to look like my customer base may be slowly narrowing down to the middle aged group. This is why the Internet is so helpful now. I can reach so many more potential customers. I wrote a blog titled “Upholsterer on the Internet” a while back. I really think my survival on Cape Cod, as a self employed upholsterer, will depend more and more on the internet. Reaching locals and second home owners alike. Most second home owners live in other states, so a web presence is critical. The ironic thing with the second home owner, that lives off Cape, is that they tend to be a “younger” customer. In the years to come, I wonder what statistic this local Cape Cod upholsterer will become part of. I’ve had a site for my upholstery business on line since 2001. Created and maintained by me. The last several years, I’ve concentrated on getting my site recognized by all the major search engines. The effort has paid off because if anyone is looking for an upholsterer on Cape Cod, I can be found pretty easily in all the major search engines, using a variety of search terms. And it hasn’t come a moment to soon. I’m absolutely amazed at the calls and emails I’m getting as a result of people searching the Web. It seems like, two years ago, I’d get an email inquiring about upholstery: I’d reply with a thankful, informative message with general prices and I wouldn’t hear back. But starting in late 2008, the phone calls and emails have become more frequent and I’ve been getting most of the work. It’s like the yellow pages and newspaper ads are out and the Internet is in. Heading into the second quarter of 2009, it’s either word of mouth or the Internet from where my customers come. The location of my business plays a role in some of this. Cape Cod has a lot of second home owners who live out of state. It would make sense for them to Google me, but I’m getting locals as well. Upholstery, especially small shops like mine, have long since been considered a dying trade. So I find it ironic that something so modern as the Internet is breading new life into such an old business model. There is also a generational shift to go along with it. One reason upholstery was considered a dying trade is the age of it’s mainstay customers, the World War II generation. My new Internet customers are either very hip, up to the times older people or the children and grandchildren of the World War II generation. So now my focus is to maintain a strong Internet presence and reinvent my business model for a new type of customer. So far I’ve only had one customer ask if I wanted the GPS coordinates to the house and I haven’t received any text messages for an estimate. So there’s plenty more 21st century to go for this upholsterer on the Internet. A long, long time ago, before I moved to Cape Cod, I was on Siesta Key, in Sarasota throwing a frisbee on the beach. I wasn’t on vacation, I actually lived there. A woman comes walking down the beach with a frisbee and starts throwing the disc with a friend and I. A bit later, she’s got to leave because she’s meeting some other people further down the beach. So after a while, my friend and I are still hanging out, when the same woman with the frisbee comes back. So we start talking again and one thing leads to another, and I asked her if she wants to go to the movies. Yea, she said yes! That was easy. We end up at the movies a few days later. This movie, way back in 1982, was Richard Pryor Live. Now I love Richard Pryor, but it wasn’t a good choice for a first date. The main topic, that night, was about her sister. My sister this, my sister that, you’ve got to meet my sister. Her sister was apparently looking for a part time job and knew how to sew. Since I am in the upholstery business and I actually did need someone to sew, what’s a guy to do other than say – ok, I’ll meet your sister. So the sister, Marge, pulls up to my shop in in a sporty 1981 Renault Le Car, sun roof and all! So after a few weeks and a few cushions later, it turns out Marge took a few sewing classes in school and sewing was just the keyword used by her sister for us to meet. We decided dating was the new keyword. We’ve been happily together ever since with a beautiful daughter. I know, just another upholstery love story. 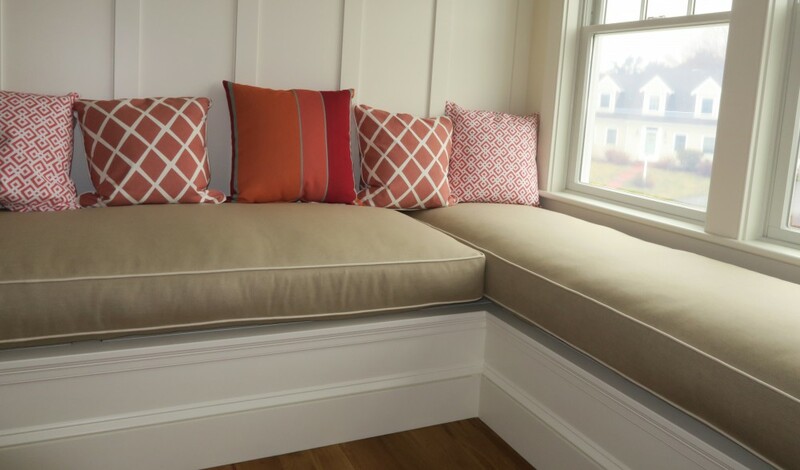 One of the ways to make an upholstery job look great is to have the fabric on straight. You also need to have the patterns line up, especially stripes. Here’s the best way to do that. On the frame, find the center of the front and back and mark with a pencil or chalk. Now on the fabric, do the same: Find the center of the front and back and mark with a piece of chalk. Notice I didn’t say pencil. If you mark the fabric in the wrong place, pencil will not come out. Chalk, you simply brush or blow it off and mark it in the correct place. As an upholsterer, I live by the center line!